Maybe you’ve had this experience: You’re running late for work on a dreary Monday morning. You jump in your car and start to back out of the garage… and you hear The Noise. It’s not quite a grinding sound and not quite a crunching sound; it’s one of those indescribable car noises you find yourself trying to imitate over the phone when you call the shop. The folks at the shop ask you all sorts of questions about your car, none of which you can answer because, quite frankly, you don’t know a fan motor from a rotor. (OK, maybe you do, but bear with us for a moment.) Since there’s no hope for an over-the-phone diagnosis, and since The Noise is getting louder and more insistent, you drive straight to the shop—and brace yourself for an unhappy call to your boss. Three hours and a couple hundred dollars later, The Noise is solved: You’d backed out over a trash can lid, and you were dragging it down the street. Now, we’re an HVAC company, so why’d we tell you a (slightly far-fetched) story about a car repair? Well, because it illustrates why you should care about how home HVAC systems work. Without an understanding of the basic components of your system and how they work together, you’ll have a tough time diagnosing issues and describing your problem when you call us for help—which may cost you extra time and money. So let’s do a quick HVAC 101. HVAC, as you likely know, stands for Heating, Ventilation, and Air Conditioning—and those happen to be three of the four major components of your system. The fourth is your thermostat. (THVAC isn’t quite as easy to say.) Let’s break each of those components down. Your thermostat is what triggers the rest of your HVAC system to get to work. When the air is cooler than the temperature you’ve set, the heat kicks on. When it’s warmer, the AC starts up. DIY HVAC Tip: If your HVAC system isn’t working, the first thing to check is your thermostat. Did it get bumped to the wrong setting? Did the batteries die? Most homes have gas-powered heating systems, so that’s what we’ll describe here. (If you have a different set-up and have a question, give us a call. We’re your Santa Fe HVAC experts!) The heart of your heating system is your furnace, which includes a burner, heat exchanger, and blower. When your thermostat gives the system the thumbs up, the gas valve opens and ignites the burner, which generates heat. That heat moves to the heat exchanger, a series of curved metal tubes. As the heat moves through those tubes, it’s transferred to the air circulating around it, and that newly warmed air is then pushed by the blower through your ducts and out the registers in various rooms of your home. DIY HVAC Tip: Gas furnace not kicking on? Check to make sure your pilot light is lit. If it is, the thermocoupler may be malfunctioning. If your furnace seems to be on, but the air coming from the registers isn’t warm, there may be a problem with your heat exchanger. Your ventilation system includes the air returns inside your home and the flue or exhaust outlets. 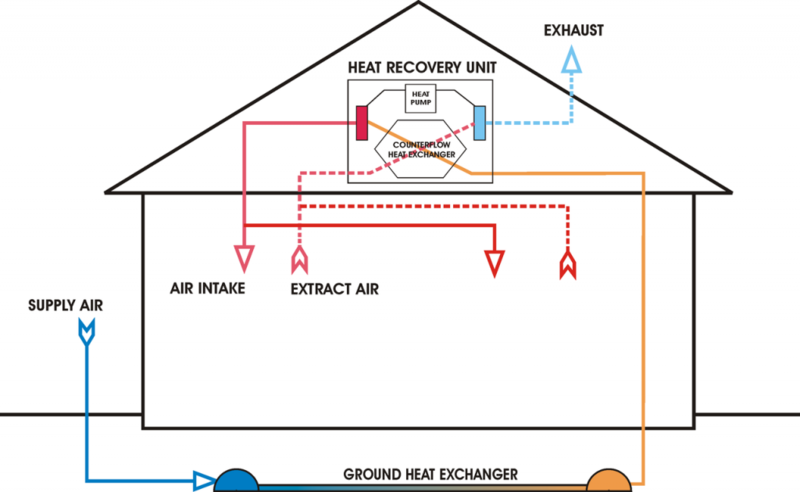 Air returns are located at various points of your home (look on the walls near the ceiling), and their job is to draw air from the room back into the system to be heated or cooled. The flue serves a critical purpose: It removes dangerous furnace exhaust, such as carbon monoxide, from your home and releases it outside. DIY HVAC Tip: Regularly vacuum your air returns to prevent your furnace filters from working overtime. Air conditioning is quite a bit more complex than heating, and it involves many additional components: a compressor, fan, and condenser coil (located outside); an evaporator coil (located on top of your furnace); pipes to connect the inside and outside pieces; and refrigerant. Without getting overly detailed, here’s the basic idea of how all of those components work together: The refrigerant travels back and forth between the indoor and outdoor parts of your system. As that refrigerant moves from the outdoor compressor to the indoor evaporator coil, it changes from a liquid to a gas, which absorbs heat from the air (science!). The now-cooled air is forced (by the same blower your furnaces uses) through your ductwork to your rooms. Meanwhile, the refrigerant, which has now changed back into a liquid (science again!) heads back outside to the compressor, and the process starts all over again. DIY HVAC Tip: If not much air seems to be coming from multiple registers in your home, your evaporator coil may be frozen. What causes that? It could be that you have a refrigerant leak. It could also be that not enough air is moving through your system because of a blower malfunction, because your filter needs to be changed, or because some of your vents are blocked. Sometimes, knowing the basics of your HVAC system will be enough to help you diagnose and fix a problem. If you get stuck, give us a call. We’ll get your home comfortable again!